A complete set of the best all-in-one project paint! BioColor® is so versatile - use with brushes or paint accessories to create a huge variety of dazzling effects! Unlike other paints, it spreads and adheres easily to paper, plastic, wood, foil, metal, and cardboard. 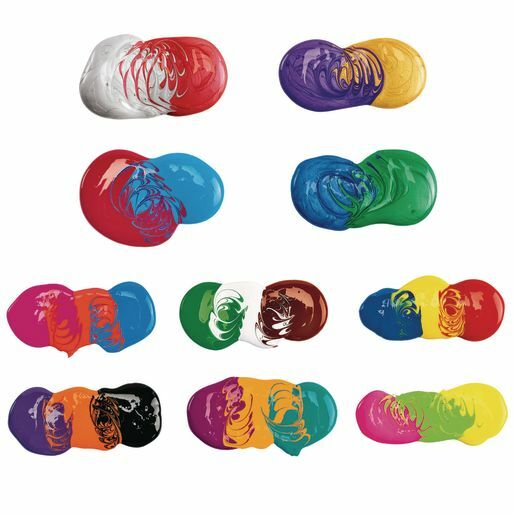 Smooth, creamy BioColor dries to a glossy finish and won't crack or fade with age. Includes 11 original colors: black, blue, brown, magenta, orange, red, turquoise, violet, green, white and yellow; 9 fluorescent colors: blue, green, magenta, orange, pink, purple, red, turquoise and yellow; and 6 metallic colors: blue, green, gold, purple, red and silver.